Soup is such a great food to eat at this time of year, as it’s so warm and comforting and it’s a great meal to have on those cold, snowy days. Being an avid Weight Watcher, I am always on the look out for healthy, low calorie soup recipes that will taste great and have as few Weight Watchers Points as possible. 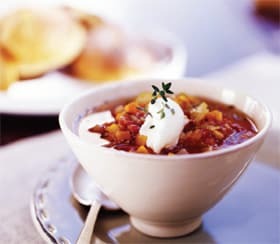 And this Mexican Weight Watchers Soup Recipe certainly fit the bill! It has zero Points, is loaded with fiber and vitamins, and tastes amazing!! I usually make the whole recipe and then freeze individual servings of it, so I can just take it out and easily reheat it anytime I’m too lazy to prepare another meal, or anytime I’m craving some yummy soup! It’s also the perfect vegetarian recipe and vegan recipe to serve up to anyone with dietary restrictions. So the next time you are thinking about giving in to your Mexican food craving and driving through the nearest Taco Bell, so yourself a favor and give this delicious 0 Point Soup Recipe a try instead! Put snap beans, garlic, zucchini, tomatillos, jalapeno, diced tomatoes, green chili pepper, onion, green pepper, cumin, oregano and vegetable broth into a large soup pot. Puree roasted peppers with chipotle in adobo sauce in a blender or food processor, and add to soup; stir to combine. Cover and bring to a boil over high heat. Reduce heat to low, and simmer, partly covered, for about 10 minutes. Stir in salt, lime juice and cilantro. Serve and enjoy! Makes 12 servings. I am not a big fan of zucchini. What would be an ok substitute? Thanks! This was excellent. I really like the green beans. I added a spoonful of your black bean and corn salad, some Guiltess Gourmet corn chips, about half an ounce of chicken breast, and a sprinkling of WW shredded cheese, bringing it up maybe a point or two (I haven’t tracked it yet.) What a treat! A friend from N.Y. mentioned this to me.